If you feel like your Instagram, Twitter, or Facebook has been inundated with an influx of selfies featuring your friends with slimmed, slightly paler, slightly rosy-cheeked faces over the past few days, you’re not alone. 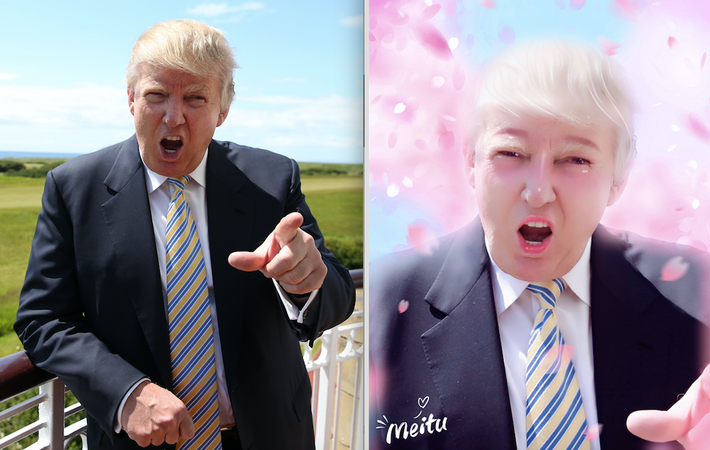 The popular Chinese photo-editing app Meitu — an app which Forbes Asia pointed out back in May 2016 and went public in December as per a report from the New York Times — seems to have suddenly surged in popularity here in the States. The app is free and offers about 9 zillion different options for editing your photos, but it’s not the most user-friendly. Here’s what you need to know to expedite the process of creating your own “hand-drawn” selfies. Step 1: Download the app. This is easy. Step 2: Open up the “Hand-drawn” feature. The app will potentially open directly to this feature, but if it doesn’t (like we said, the app is a bit of a pain), swipe left from the app’s main menu and tap the blue “Hand-drawn” box with the picture of the woman with the giant eyes. This will soon be you. Step 3: Tap “Try now.” Meitu currently tells me this feature has been “activated” over 100,000,000 times. Which, great, I guess. Step 4: You’ll be prompted to choose from your camera roll, “Album,” or to take a new selfie to edit, “Camera.” Be sure to grant the app access to your photos and camera. Let’s assume you’re taking a new selfie to edit. Step 5: Take a selfie. Make sure you see the word “Effects” highlighted in blue, rather than the word “Beauty.” This will be important to making you look better in the next step. Step 6: Choose a filter. You’ve got a bunch of options ranging from “Jungle,” which just seemed to make my face thinner, paler, and pinker, and not at all like I’d recently been in the Amazon; “Fresh,” which did all that plus turning my lips the same shade as Pepto-Bismol; and “Youthful,” which made me look like a hot baby by smoothing all wrinkles from my skin with the added benefit of also blurring my nose into oblivion. (If you want to get really fancy, you can tap the tricolored logo on the lower right-hand corner of the screen and play with the levels of each filter, but we’re just going with the basics here.) Once you’ve found your filter, tap the blue check mark. Step 7: Select another filter to put over your now flawless (read: problematically edited to comply with a certain standard of beauty) selfie. These are the fun ones: “Angelic,” which basically eliminates your neck and floats your head amongst a teal sea dotted with white feathers; “Mermaid,” a nice bubble effect with the added benefit of making your eyebrows pop; or my personal favorite, “Petals,” which I’ve added to this picture of PEOTUS, who I think should really consider this lip color for the inauguration. Step 8: Tap the pink “Save” button in the upper right-hand corner of the screen. From there, you can opt to share the photo from the Meitu app on Instagram and Facebook or you can use use the image you saved to your camera roll at a later time.